If you’re looking for the most delicious vegetarian food in Nottingham, then you’ve come to the right place. On the doorstep of Roomzzz Nottingham are several places to eat the serve up a vegetarian feast for the senses. 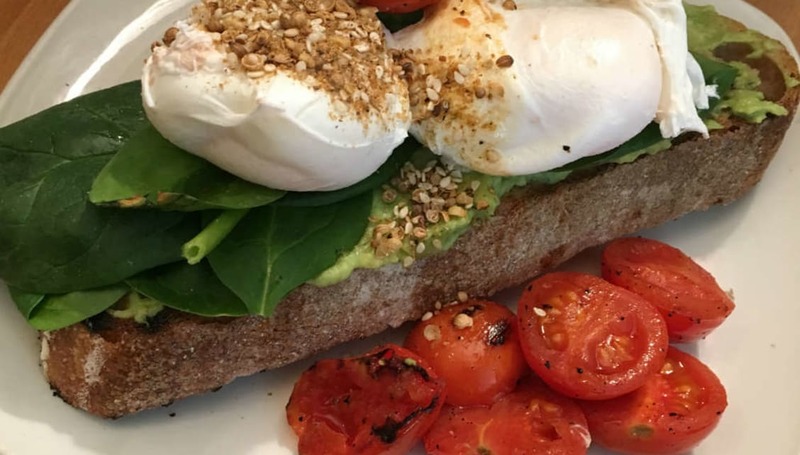 Here are some of our favourite places to eat in Nottingham when eating meat-free. A down-to-earth pizza place where you definitely need to book a table if you want to eat some tasty pizza. Oscar and Rosie’s, located on Stoney Street, is famous for their 14-inch pizzas and they also have an amazing vegan menu too. Try the Shamster – complete with cheating ham and roasted flat mushrooms – or The Checkpoint, a pizza topped with butternut squash roasted with cumin and chilli with caramelised red onion and fresh sage. 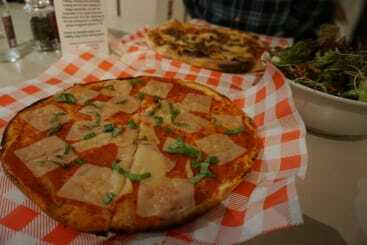 Simple is sometimes the best though and the regular Margherita pizza is a hidden gem in their varied vegan menu. If you’re feeling brave, you can tackle the “Pizza By The Metre” which is exactly what it says on the tin so arrive hungry, and leave happy and full on pizza that’s been lovingly created to a soundtrack of AC/DC and Fleetwood Mac. 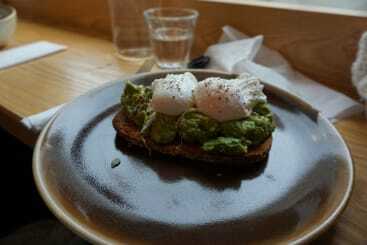 Cartwheel Café and Roastery does the most delicious smashed avocado on eggs you’ll ever try. Take a seat in this industrial yet welcoming café and try out this staple dish or go for their “Eggs & Sides” where you can pick eggs whichever way you like along with two sides, including mushrooms and onions, leafy greens, homemade baked beans, mashed avocado, or new potato hash. There’s also the option to make things vegan and they even have gluten-free bread too if you have any intolerances. If you prefer a sweeter start to your day, Cartwheel Coffee also do a sweet pancake with vanilla cream, toasted almonds, banana chips, and maple syrup. 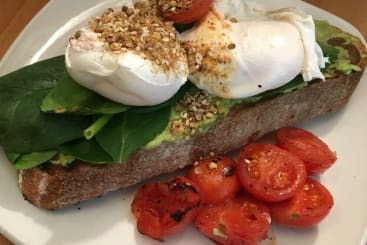 A deli for the serious foodies out there, Delilah doesn’t only just cater for those looking for a taste of Nottingham’s local food scene, it’s a place for those looking for a good meal too. For brunch, try out their vegetarian frittata or avocado bruchetta. There’s the flatbread pizza or the antipasti platter for lunch, or if you want something a little lighter, why not try out the aubergine and pomegranate salad? It’s a lovely place to enjoy a vegetarian meal and sitting on the mezzanine level of the building means you can take in the stunning architecture of this building from a different perspective. This place might not sound like a vegetarian heaven, but it is. In fact, all the burgers on Annie’s Burger Shack menu can be made vegetarian or vegan and each burger comes with a healthy portion of fries too so you’ll definitely get a good feed while you’re here. Annie, originally from Rhode Island in New England USA, has brought a true American flare to this burger shack and all food is traditionally cooked on the grill which gives each and every meal an authentic USA flavour! If you want doughnuts, come to Doughnotts. These handmade doughnuts are made fresh every day and we bet you’ll want to come back for more after seeing the variety of flavours they do. From Lemon Curd to Salted Caramel, these doughnuts look as good as they sound and Doughnotts also do a big vegan selection too! 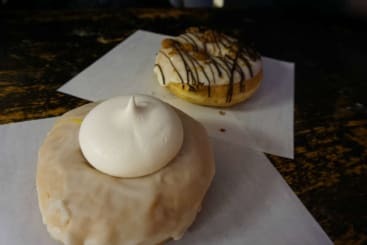 And don’t worry if there’s a queue as you walk down the stairs into Doughnotts store, the doughnuts are worth the wait! Have you been to Nottingham before? Let us know what vegetarian food you’ve had! Also, if you’d like to stay in Nottingham, you can book on the Roomzzz website today!